The School of Golf aspires to be an organisation that promotes and grows the game of golf at all levels. We aim to achieve this by delivering high quality, professional coaching to golfers of all ages and abilities across Essex. 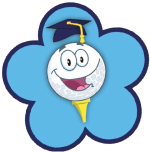 The School of Golf are official stockists of Mkids golf. We have a variety of stock across our Chelmsford and Southend sites. 'Discover Golf' with The School of Golf, hosted at Little Channels. English Learning Disability Sports Alliance. A partership between Special Olympics GB and MENCAP.